* Thanks for your interest in sharing Clay Times with a friend! Please enter your friend's contact info. 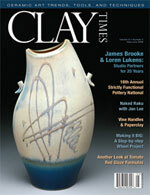 below, and we will provide them with a free sample issue of Clay Times magazine, courtesy of YOU! (And rest assured -- Clay Times will not share or rent this information to ANYONE!) Doesn't it feel great to share?